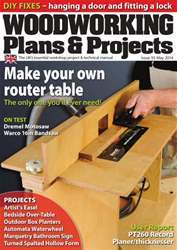 In this month’s issue of Woodworking Plans & Projects – issue 93 – Wendy Greenwood shows you how to make an outdoor planter; Simon Rodway creates an easel for budding artists; Mark Baker looks at a simple method for making hollow forms and John Hawkswell constructs a waterwheel, complete with moving figures We also have Amber Bailey making a bathroom sign and Walter Hall creates a cantilever over-bed table. All this in our ‘Projects’ section. 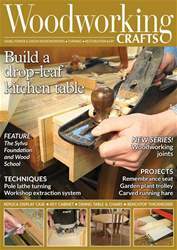 In the ‘Techniques’ we have the usual ‘DIY fixes’, in which the Editor shows you how to trim an ill fitting door, and ‘Workshop notes’, where he looks at a number of jack planes, from the 1930s to present day. 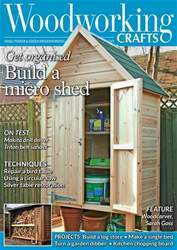 Our ‘Features’ include an article on the use of charcoal, and how it could be an answer to solving climate change; we also bring you details of the presentation for Triton Woodworker of the Year and Colin Sullivan takes a look at the history of the Hobbies company in ‘Tools of yesteryear’. 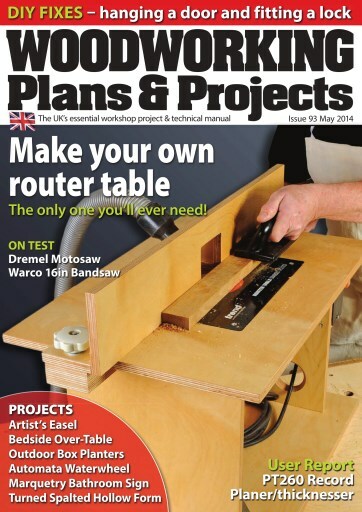 In ‘Kit & Tools’ we test a Dremel MS20 Moto-saw, as Amber Bailey puts it through its paces and Walter Hall tests the Record power PT260 planer/thicknesser. 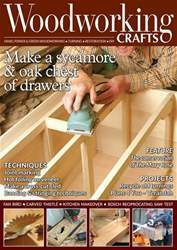 We also have the usual ‘Craftsman’s corner’ and ‘Hot Stuff’, as well as ‘Noticeboard’ and a ‘Leader’ from the Editor himself, Anthony Bailey. All this and more in issue 93!